Leonhard is a Häusler [cottager or day laborer?] who was himself born in Affing on Nov 6, 1795. He married Creszenz Helfer on Febr 10, 1823. She was born Nov 17, 1792 in the village of Totenwies, a short distance to the NW of Affing. Creszenz is a name not familiar to me but I find it used as spelled in the area of Augsburg. It may be derived from Crescentia which is an old German or Latin name. There are Helfers living today in Todtenweis and I have made made much progress in tracing the Helfers through Todtenweis and beyond. The couple had 8 children of whom only three survived childhood. There are notations after three of the names that begin with 'verh(eiratet)' that means marriage. Child number 3, Joseph (my GG Grandfather), was married in Dinkelsbühl. I cannot yet figure out where child #4 married. Sophie, child #6, married Herr. Gnugyesser hier. 1. Xaver *27 Sep 1823, +6 July 1827. 2. Mathias *27 Sep 1824, +23 Dec 1826. 5. A. Maria *23 Sept 1830, +12 Nov 1830. 6. Sophia *24 Dec 1831. 7. M. Anna *13 Aug 1833, +4 Dec 1833. Addendum: I found the Family Register of Daughter #6, Sophia. It appears that Leonhard lived with this daughter in his old age. One of the fun puzzles of tracing this part of my family is the little mystery of the spelling of Baÿerl. To my first inspection, it does indeed appear that in this record, Baÿerl is spelled with an umlaut-- or is it? Compare the diacritic mark in Baÿerl to the "real" umlaut over the 'ä' and the standard 'u-bogen' or little hook that appears over every regular 'u' to distinguish it from an "n". (This is not the same as a ü umlaut.) Was Baÿerl just written swiftly without clearly making the double strokes? (I believe this is the case.) For comparison look at the diacritic marks in the month of July (Child 1) and May (Child 8). I can say that every "y" written in the indexes of records of Affinng in the mid 1800s has an umlaut over it, no matter what the name is. Recall that many of the original records were written in Latin. I supsect this introduces confusion between the letters "i" and "y". (It is my understanding that there is no letter "y" in Latin.) Note above in child #8 the spellings of Juni and May. At least this priest seemed confortable writing both letters. 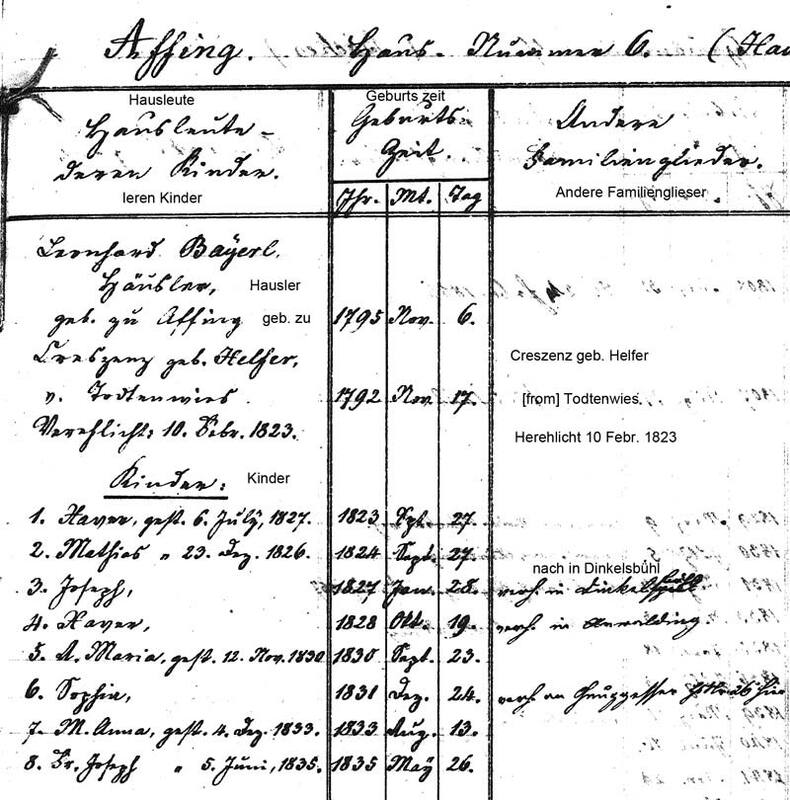 See also the Family Register of Leonhard's nephew, Andreas Baÿerl; and Carolina Baÿerl, and Maria Anna Baierle.